The Maestro Multi-Location Fan and Light Control Kit helps transform any room where lights are controlled from multiple locations to create a whole new level of comfort. As you enter the room, this single Maestro combines the function of one fan control plus one light dimmer. Change the fan speed and adjust light level with one control---eliminating inconvenient pull chains. LED's indicate light level on top control and fan speed on bottom control, and the fan control allows you to recall your favorite fan speed and light level. Seven quiet fan speeds enhances the comfort of any room. This package includes one wall mounted Maestro Multi-Location Fan and Light control, one fan-mounted canopy module, and one Maestro Companion Fan and Light control. For use with indoor ceiling paddle fans only. Maestro fan/light controls work with virtually all existing wiring. Coordinating Claro wall plates sold separately. Controlling lights, shades, and temperature from a mobile device has never been easier or more reliable. The Lutron Smart Bridge allows for setup, control, and monitoring of Caseta Wireless dimmers and Serena Remote Controlled Shades from a Smartphone, tablet, and even your Apple Watch TM wearable. 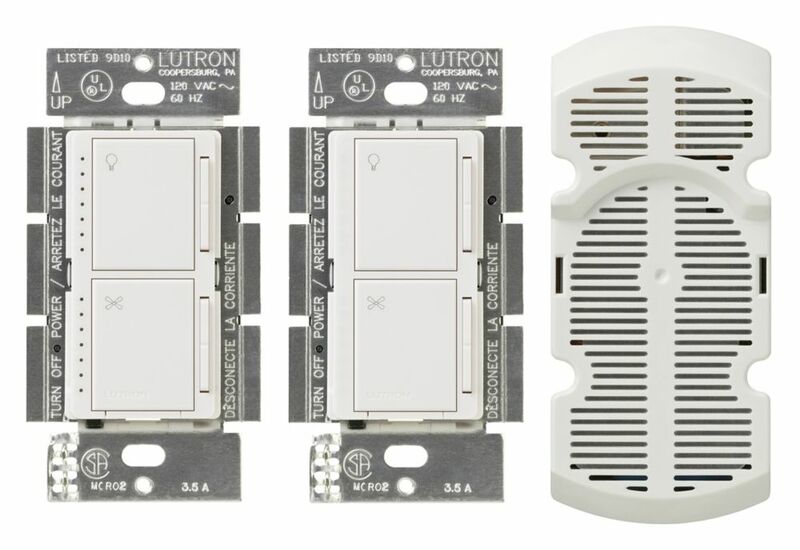 The Lutron Smart Bridge also works with Nest, select Honeywell Thermostats, Logitech Harmony remotes, Apple HomeKit and Xfinity Comcast. Schedule lights to adjust automatically based on the time of day, or create your favourite scenes that adjust multiple lights and shades with the press of a button. Enable geofencing to automatically turn your lights on/off when you leave or approach home, or to notify you that you left your lights on. All compatible products sold separately. Maestro 1-Amp Multi-Location 7 Speed Combination Fan and Light Control Kit, White The Maestro Multi-Location Fan and Light Control Kit helps transform any room where lights are controlled from multiple locations to create a whole new level of comfort. As you enter the room, this single Maestro combines the function of one fan control plus one light dimmer. Change the fan speed and adjust light level with one control---eliminating inconvenient pull chains. LED's indicate light level on top control and fan speed on bottom control, and the fan control allows you to recall your favorite fan speed and light level. Seven quiet fan speeds enhances the comfort of any room. This package includes one wall mounted Maestro Multi-Location Fan and Light control, one fan-mounted canopy module, and one Maestro Companion Fan and Light control. For use with indoor ceiling paddle fans only. Maestro fan/light controls work with virtually all existing wiring. Coordinating Claro wall plates sold separately. Maestro 1-Amp Multi-Location 7 Speed Combination Fan and Light Control Kit, White is rated 4.7 out of 5 by 19. Rated 5 out of 5 by Ray from Easy to install. Worked perfectly. Easy to install. Worked perfectly. Rated 4 out of 5 by Ron from Worked as stated and straightforward install. Only gripe it does... Worked as stated and straightforward install. Only gripe it does not work for LED's and they do not have a similar product that does (Hello Lutron, get with it), otherwise I would give it 5-star. Rated 5 out of 5 by Padre from Amazing for a room with a 3 way light situation... Amazing for a room with a 3 way light situation but want a fan/light combination! Rated 4 out of 5 by derek from Works well so far. Installation was easy enough and I can now control the fan and light separately from both locations without having to change the house wiring. Very glad to be rid of the pull chain switches. Rated 5 out of 5 by Joe from Great product for two location controll of both the light... Great product for two location controll of both the light and fan from the wall. No more pulling chains!! Only two down sides: One is they are expensive. Two is that you cannot use L.E.D. lights. Some users have said they have been able to get it to work with L.E.D bulbs but it did not with ones I tried. Other than that they function as expected. Rated 5 out of 5 by None from Installed easily, and worked well. The perfect solution to control... Installed easily, and worked well. The perfect solution to control both a fan; 7 speeds, and a light dimmer mounted to the fan with only two wires at the fan. GREAT DEVICE!! !